If a movie were made with an enemy from an unreachable solar system raining down tsunamis, hurricanes, floods, droughts, nuclear disasters, armies of crazed terrorists… leaving swarms of refugees, homeless families, hungry children, mangled bodies amidst increased inequities; how long into the movie would it be before the self-proclaimed greatest nation added an army of do-gooders to address tragedies and heartbreaks and lead other nations to do the same? Why don’t we address the results of ugly acts, of warfare, of nature’s anger that repairs and removes the causes of such acts by building a new international army that marches to change the psyche of continuous warfare and lets people get to know, work with, and care for people as brothers and sisters? Many believe he would have been one of our greatest presidents. He would have removed us from Vietnam more quickly, replaced the privately controlled Federal Reserve, chopped off some of the CIA’s hidden tentacles, and nipped in the bud the flow of power to the rich, entrenched, and connected. There is, however, a grander reason for his greatness that more clearly fulfills the visions of Camelot. Had JFK had 2,900 rather than 1,000 days to implement his visions, the reason he would have been one of our greatest lies in the army and spirit he was building. The Peace Corps. Kennedy possessed the charisma and communication skills to build that kind and size army. With his assassination, the momentum to “peace corporatize” this different army into the world of nations quickly decelerated. His challenge that other nations should do the same kind of service building, “…but what together we can do for the betterment of mankind…,” died with him. Kennedy’s momentum helped the Peace Corps reach its apex of about 15,000 volunteers in the field in 1966, a paltry number compared to what Kennedy envisioned; and a number that has bumped downhill since, so that in 2016 it stands at about 6,800. Without JFK’s drive and charisma, the numbers went the other way. During the Vietnam era of August 1964 to May 1975, 9,087,000 military personnel were on active duty. What if the idea of sending Peace Corps to the world’s troubled spots to contain poverty and “isms” had been imprinted into the American international relations psyche during JFK’s Camelot Era? What if that kind of national service had been fielded much more often as an answer to “what you can do for your country, ” rather than carrying a gun into what too often has been trumped-up wars? Over the decades, how much cheaper would peaceful, development-oriented national service have been than bloodying our troops behind armadas, stealth bombers, and drones? What if a man of Kennedy’s vision and communication skills had talked to Ho Chi Minh, who supposedly admired America so much that he had worked his way over as a young man on a merchant marine ship to see the country he admired? Would the world be healthier today if decades back we had established a common sense army that invaded doing development rather than destruction? Would such public policy action have lived up to JFK’s words that inspired the world, and especially its poor, to hang pictures of him on their walls in Mumbai, Cairo, Cape Town, etc.? Would our nation and world be smarter, healthier, and richer had tens of millions of Returned Peace Corps Volunteers (RPCVs) brought their insights, knowledge, and good will home? Since 1776 the USA has been at war for 222 of its 239 years. Through 93% of our nationhood, have we been sending the right armies into the world? Have we even built the right army for the 21st century? Was the warning from a retired five-star Army general, who directed the allies on D-Day, knowledgeably led the nation as president for 8 years, and in his farewell White House speech stressed the lurking danger of the growing union of a military-industrial complex, not enough to reverse the march to a Terminatorish society? From 1950-2000 we placed 118.9 million Americans into active military service (2.33 million annual average), according to the conservative Heritage Foundation. Spread out over 700+ world-wide bases, we use their bodies, blood, and physical and mental wounds to expensively implement foreign policies, while polluting the atmosphere fueling an awesome armada. During George W’s Iraq War, the cost of fielding an active duty Star Wars clad soldier climbed to $1 million each. Each of the addition 9,800 troops assigned to Afghanistan in 2015 is estimated to cost $2.04 million. Ike must be regurgitating. To offset our militant numbers barely 220,000 PCVs have served by 2016. Sandaled 21st Century Army Needed? Why don’t we mount a similar, albeit more modest financial effort that leaves a modest environmental footprint, to field a million Americans a year at home and abroad into peaceful, development oriented, common sense, cost effective national service through already proven non-profits that contains crazed “isms,” dramatically reduces wars, and works to rebuild the havoc an angry Mother Nature is dumping on people? JFK’s Peace Corps and other existing do-good service corps have proven we can do this today for $30-40,000 per sandal wearing volunteer, whose wounds are generally limited to empathy-induced domestic or reverse culture shock. If the answer continues being, ”We can’t bother doing that, because we have so many radical, crazed “…ists” to kill,” then Camelot will be replaced by Dronealot. Droning a lot over time increases the odds that the stealth enemies such droning produces will, in time, cause America’s ascendancy to stall and then fall. Most often our public policy seems to be: “Kill ‘em first… Ask forgiveness later” or expect they’ll forget the loss of loved ones. Our policy post-911 should have been a thorough investigation augmented by a worldwide police action, including swiftly dropping our Special Forces into those areas where some of those involved were reported to be. It should not have been an invasion into uninvolved Iraq, which promised to open a hornet’s nest for the violence prone and gold mine for greedy war profiteers in a part of the world that was so anxious for jobs that many easily fell into the ranks of crazed terrorists. When specious fear centric arguments are made and big media ignores or fails to fund investigative reporting, we tend to march off to another trumped-up war, where the .5% who have served in recent wars suffer most. The minuscule percentage who serves, mostly the low and middle classes, often unknowingly, bear much more of wars costs than the connected, politically aware, and war hawks do. Adding to war’s bloody stain, our recent wars have not been over what’s right but more over the benefits accruing to the .5% at the top end of the economic spectrum. Before “kill ‘em” is decided upon, the electorate should know: What are ‘killings’ long-term effects? Who benefits? Who suffers? Who pays? In the eight years since that article/report, has dangerous crazed terrorism lessen, hardened, or spread? If you’ve been in a cushy MTV trance, be informed that the situation has worsened, even while dramatically increasing costly resource allocation to combatting crazed terrorism and its complexities. Do we need different or at least additional strategies? From 1950 – 2000, 198.8 million Americans have ‘served” our nation’s military corps. During the recent Iraq debacle over 2.5million have served, Of those, more than a third were deployed more than once, so you may need to multiply that by about 3 to get a more accurate body count of those who have served (7.5 million). No matter the cost, continue doing what you’re doing? Constituting a particularly grim facet of this mental health crisis is the doubling of the suicide rate for US Army personnel, with many who attempted suicide suffering serious injuries,” opine the report authors. Massive direct spending on the two imperialist interventions continues. With over 60,000 US troops remaining in Afghanistan, it is estimated that the cost of deploying one American soldier for one year in this war amounts to $1 million. About 2.5 million men and women have served in Iraq and Afghanistan, and just over 1.5 million had left active duty by September 2012. Of those, more than half were receiving government medical care, and one out of every two veterans had already applied for permanent disability benefits. “The U.S. has already borrowed some $2 trillion to finance the Afghanistan and Iraq wars and the associated defense build-up — a major component of the $9 trillion U.S. debt accrued since 2001,” she writes. Any accounting of other macroeconomic costs associated with the wars, such as the impact of higher oil prices on aggregate demand, would easily bring the total to $6 trillion. All this is done with very little service to America by 99.5% of the populace – who have not served. Many of those non-servers rave about how “exceptional” they are as they dodge the potholes of “national service free” America, as Karl W. Eikenberry and David M. Kennedy point out in their May 26, 2013 New York Times Op-ed: Americans and Their Military, Drifting Apart. With all that money spent on the .5% of Americans, what’s the feeling of our soldiers who went off to a trumped-up and consequently prolonged Iraq/Afghanistan war? USA’s April 20, 2015 edition headlined Today’s Soldiers hate their jobs and detailed that 52% felt pessimistic about their future. Did sending our troops quash or quell the problems and problem makers? When one sources thinkbynumbers.org one finds that from 1993-2005 troop increases tracked with suicide bombing increases; and extensive research gathered at this Washingtonblog verifies that increases in foreign military intervention tracks with increased terroristic responses. The Greatest Generation was great because Mother Liberty accepted almost all to a bustling nation with room to grow, almost everywhere immigrants worked at building community, almost all suffered and fought through the depression. Almost all flocked together to win the war. Whether across the ocean or at home, almost all Americans served. They served in reverse proportion to the numbers who fight hardships at home or abroad today. They fought in a country that had nowhere near today’s income inequality. The Greatest Generation was… because almost all shared directly or indirectly in the horrible images of war and warring, in the mangling of soldiers and citizens’ bodies and minds, in the tears a soldier delivered envelop brought to a mother’s eyes at the screened door, in the bruising building of the implements of warfare… And tax paying and war bond buying to pay for a necessary war was shared by all, including taxing the very rich at high rates. Between 2000 – 2015, with our population at 320 million, 1.4 million Americans do active national service in our military, about 0.44% of our population. Back among the Greatest Generation, whose character and characters we are losing, the case can be made that about 32.65%+ of the Greatest Generation performed some form of national service. Those words, penned in 1892 by Francis Bellamy, a Baptist Minister and Christian Socialist, were intended to keep the nation marching toward good health and opportunity for all. Today former Commander of International Forces in Afghanistan, General Stan McChrystal, echoes what many others have been suggesting. Most historians would agree that a Great Leap toward the “One nation…” happened in the 1940’s, when about 2.3 million drew upon the earth for sustenance. Back in the 40’s glaciers were bigger, flooding heavily populated areas less prevalent, fracked water unknown, climate weirding not yet believed by 98%+ of scientists, monstrous wealth disparity not so garish. In 2015 with 90% of glaciers shrinking, flooding and earthquakes consistently devastating millions of lives, fracked water igniting from taps as well as on Oklahoma quake-ridden plains, 7.3+ billion earthlings ought to be doing much more than just talking about and suffering from climate weirding. In April of 2015 Nepal had a devastating earthquake, with continuing aftershocks. Imagine if the American World Service Corps Congressional (AWSC) National Service Proposal (AWSC Proposal) had been enacted years ago. 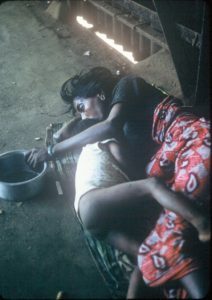 The Peace Corps, International Rescue Committee, Doctors Without Borders, Habitat for Humanity, Oxfam, American Friends Service Committee, Mercy Corps, UN aid agencies, home for the aged, hospital therapy wards, etc., would have thousands of additional volunteers of all ages that they could quickly allocate to assist quake-ravaged Nepal, as well as help with refugee resettlement problems throbbing throughout the world, alleviate domestic poverty, etc. Isn’t it time to build a voluntary national service program, which the AWSC Proposal does, that rivals in size our voluntary active military 1.46 million service program? How much would a million Americans doing AWSC national service at home and abroad deflate the Internet propaganda being used by crazed terrorists who view violence as the primary means to change society? How much smarter would such robust in-field experience make our present and future public policy decisions? How much could other small and large national powers be influenced to emulate the US by introducing their own ROBUST national service programs? Would it be healthy for the planet if we pushed other nations to compete (for lack of a better word) and comingle with the US with their own peaceful national service programs, rather than through increasing budgets for expensive and bloody military corps? How much richer would the earth be if Russians, Iranians, Chinese, Israelis, etc., served side-by-side in joint American/(pick a nation) national service for a year or two of their lives. Might Palestine be less of cauldron and mess if an American/Soviet Peace Corps been operating their for the last 20+ years? In the late 80’s People’s Lobby (PLI) pushed legislation to establish an American Soviet Peace Corps (ASPC) that would have Soviets and Americans serve together as PCVs. PLI assumed that if such service and friendship bonds were established 10-30,000+ times, the odds of these two giant nations warring or reaping worldwide havoc would diminish significantly. A wise and peace loving Congresswoman Boxer expressed her interest in this 1984 letter and expressed her vision in this 1988 letter. In 1989 she introduced HR1807 to form a US Soviet Peace Corps (USSPC). From community groups, to elected officials, to former Peace Corps directors, to the Soviet Consulate, etc., great support existed for initiating an USSPC. Then, as the Soviet Union imploded, the legislation withered away. By missing the late 1980s opportunity to build a corps that Jesus, Mohammed, and Buddha would have preferred, we continued playing out Charlie Wilson’s wars and ushered in a bare-chested Putin who we engaged in playing chess by moving tanks, soldiers, missiles, and military alliances around as if reheating Cold War habits was smart progress. Are the world’s powers learning fast enough that building together is healthier for the human race than bombing each other? 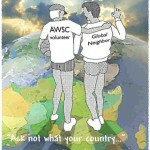 Shouldn’t America lead the way in building a robust American World Service Corps peaceful service umbrella, push other nations to do the same, and willingly have our Peace Corps volunteers serve alongside volunteers from other nations? Wouldn’t such AWSC National Service enhance our and their understanding of world needs and provide means of addressing those needs that are hundreds of times cheaper than relying on military answers to world problems? Recently a nuclear accord between Iran and us was brought home to the United States Senate, a daring gamble on diplomacy and development vs. warplomacy and destruction. Wouldn’t it be great if during this encouraging era our diplomats offered to the overwhelmingly young nation of 80 million Iranians seeking employment, rapprochement, and understanding that they consider joining us in an American-Iranian Peace Corps? Why don’t we revive the American Soviet Peace Corps? Let Americans choose to do the same domestically under that same proud AWSC National Service moniker as we count a million Americans a year doing full-time, paid national service via already existing Americorps, VISTA, Habitat, Head Start, and address needs as Candy Strippers, volunteers at homes for the aged, hospitals’ therapy departments, etc. In short, the AWSC National Service Proposal has long seemed to this Returned Peace Corps Volunteer the most cost effective way to dramatically grow the Peace Corps to the size which JFK envisioned it should “quickly” reach. It DOES NOT create a huge new program, which many in Congress would attack. It does NOT draft national service volunteers, which so many in Congress claim to oppose. It DOES give Americans a myriad of good choices in which to do full-time voluntary service, choices which so many in Congress opine is high on their list of legislative requirements. It WILL make life easier for soldiers and Americans everywhere. It WILL raise the nation’s public policy IQ, which has long needed a healthy injection of hands on smartening. It WILL cut the costs of making friends, MAKE more friends, and reduce the cost in dark blood and money spent in ferreting out good information in this era of crazed terrorism. In this 2016 window where increasing American inequities are finally being discussed with some intensity on the presidential campaign trail and among the very richest (read Buffett, Gates, and the 130+ billionaires dedicating some of their money to doing good), one of the AWSC National Service Proposal’s unorthodox funding mechanisms could, with a sliver of a donation from America’s wealthiest 400, fund 21,000,000 Americans doing national service for 27 years, which is approximately a $700 billion investment. That may sound like a large number, but over a generation a handful of people have thatlaying around as chump change. Using that chump change as Pope Francis would make life more heavenly for about 7 billion people.